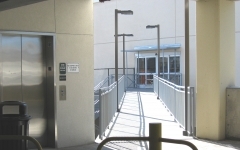 This fast-track, design-build project required the foundation design package to be submitted for the City’s plan check within one month and construction documents within three months. IPD was brought onto the project at the end of the design development phase which was done by another architect. 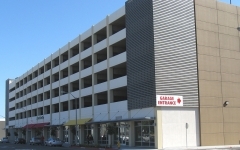 IPD recommended a re-design of the parking layout to improve the traffic circulation while providing the desired number of parking spaces, and was able to incorporate the changes and still meet the project schedule. The structure includes 13,000 SF of “white box” retail space on the ground level, a 60’ pedestrian bridge and a drive-through with 14’ clearance to accommodate tractor trailers, fire trucks and high seismic design loads due to the close proximity of the San Andreas fault. The project was completed under budget with a construction time of 13 months.